Figure 3. Necks of long-necked sauropods, to the same scale. Diplodocus, modified from elements in Hatcher (1901, plate 3), represents a “typical” long-necked sauropod, familiar from many mounted skeletons in museums. Puertasaurus modified from Wedel (2007a, figure 4-1). Sauroposeidon scaled from Brachiosaurus artwork by Dmitry Bogdanov, via commons.wikimedia.org (CC-BY-SA). Mamenchisaurus modified from Young and Zhao (1972, figure 4). Supersaurus scaled from Diplodocus, as above. Alternating pink and blue bars are one meter in width. Inset shows Figure 1 to the same scale. This paper started life as a late-night discussion over a couple of beers, while Matt was over in England for SVPCA back in (I think) 2008. It was originally going to be a short note in PaleoBios, just noting some of the oddities of sauropod cervical architecture — such as the way that cervical ribs, ventral to the centra, elongate posteriorly but their dorsal counterparts the epipophyses do not. As so often, the tale grew in the telling, so that a paper we’d initially imagined as a two-or-three-page note became Chapter 5 of my dissertation under the sober title of “Vertebral morphology and the evolution of long necks in sauropod dinosaurs”, weighing in at 41 1.5-spaced pages. By now the manuscript had metastatised into a comparison between the necks of sauropods and other animals and an analysis of the factors that enabled sauropods to achieve so much more than mammals, birds, other theropods and pterosaurs. Figure 6. Basic cervical vertebral architecture in archosaurs, in posterior and lateral views. 1, seventh cervical vertebra of a turkey, Meleagris gallopavo Linnaeus, 1758, traced from photographs by MPT. 2, fifth cervical vertebra of the abelisaurid theropod Majungasaurus crenatissimus Depéret, 1896,UA 8678, traced from O’Connor (2007, figures 8 and 20). In these taxa, the epipophyses and cervical ribs are aligned with the expected vectors of muscular forces. The epipophyses are both larger and taller than the neural spine, as expected based on their mechanical importance. The posterior surface of the neurapophysis is covered by a large rugosity, which is interpreted as an interspinous ligament scar like that of birds (O’Connor, 2007). Because this scar covers the entire posterior surface of the neurapophysis, it leaves little room for muscle attachments to the spine. 3, fifth cervical vertebra of Alligator mississippiensis Daudin, 1801, MCZ 81457, traced from 3D scans by Leon Claessens, courtesy of MCZ. Epipophyses are absent. 4, eighth cervical vertebra of Giraffatitan brancai (Janensch, 1914) paralectotype HMN SII, traced from Janensch (1950, figures 43 and 46). Abbreviations: cr, cervical rib; e, epipophysis; ns, neural spine; poz, postzygapophysis. This work made its next appearance as my talk at SVPCA 2010 in Cambridge, under the title Why giraffes have such short necks. For the talk, I radically restructured the material into a form that had a stronger narrative — a process that involved a lot of back and forth with Matt, dry-running the talk, and workshopping the order in which ideas were presented. The talk seemed to go down well, and we liked the new structure so much more than the old that we reworked the manuscript into a form that more closely resembled the talk. That’s the version of the manuscript that we perfected in New York when we should have been at all-you-can-eat sushi places. It’s the version that we submitted on the train from New York to New Haven as we went to visit the collections of the Yale Peabody Museum. And it’s the version that was cursorily rejected from mid-to-low ranked palaeo journal because a reviewer said “The manuscript reads as a long “story” instead of a scientific manuscript” — which was of course precisely what we’d intended. Needless to say, it was deeply disheartening to have had what we were convinced was a good paper rejected twice from journals, at a cost of three years’ delay, on the basis of these reviews. One option would have been to put the manuscript back into the conventional “scientific paper” straitjacket for the second journal’s benefit. But no. We were not going to invest more work to make the paper less good. We decided to keep it in its current, more readable, form and to find a journal that likes it on that basis. At the moment, the plan is to send it to PeerJ when that opens to submissions. (Both Matt and I are already members.) But that three-years-and-rolling delay really rankles, and we both felt that it wasn’t serving science to keep the paper locked up until it finally makes it into a journal — hence the deposition in arXiv which we plan to talk about more next time. Table 3. Neck-elongation features by taxon. The paper incorporates some material from SV-POW! posts, including Sauropods were corn-on-the-cob, not shish kebabs. In fact, come to think of it, we should have cited that post as a source. Oh well. We do cite one SV-POW! post: Darren’s Invading the postzyg, which at the time of writing is the only published-in-any-sense source for pneumaticity invading cervical postzygapogyses from the medial surface. Figure 10. Real and speculative muscle attachments in sauropod cervical vertebrae. 1, the second through seventeenth cervical vertebrae of Euhelopus zdanskyi Wiman, 1929 cotype specimen PMU R233a-δ(“Exemplar a”). 2, cervical 14 as it actually exists, with prominent but very short epipophyses and long cervical ribs. 3, cervical 14 as it would appear with short cervical ribs. The long ventral neck muscles would have to attach close to the centrum. 4, speculative version of cervical 14 with the epipophyses extended posteriorly as long bony processes. Such processes would allow the bulk of both the dorsal and ventral neck muscles to be located more posteriorly in the neck, but they are not present in any known sauropod or other non-avian dinosaur. Modified from Wiman (1929, plate 3). But we found and explained some good reasons why this apparently appealing arrangement would not work. You’ll need to read the paper for details. Anyway, go and read the paper! It’s freely available, of course, like all arXiv depositions, and in particular uses the permissive Creative Commons Attribution (CC BY) licence. We have assembled related information over on this page, including full-resolution versions of all the figures. In the fields of maths, physics and computer science, where deposition in arXiv is ubiquitous, standard practice is to go right ahead and cite works in arXiv as soon as they’re available, rather than waiting for them to appear in journals. We will be happy for the same to happen with our paper: if it contains information that’s of value to you, then feel free to cite the arXiv version. Kudos on using arXiv. Looking forward to the post on that. Correction- PeerJ says “we will formally open for ‘general’ submissions in November and publish the first articles by the end of the year.” Editorial submissions only right now; my bad. Interesting, I’m sure I’ll enjoy reading the paper. The high stress levels on sauropods gigantic necks have fascinated me for years as well. Thanks for making the paper freely available! Sorry, I wasn’t clear. The three-year-and-rolling delay is not anything to do with PeerJ, it’s the time that’s elapsed since we wrote the paper before it became available to the rest of the world. Waiting for PeerJ would add to that delay, but I certainly didn’t mean to imply that those guys were responsible for the three years! Just had a quick browse through it so far. Looks very interesting. However, is there a reason for not marking Arambourgiania as not being quadrupedal in yourtable? I’m not sure whether I’m misreading your double negative, David, but we did mark Arambourgiania as not being quadrupedal. If you mean that you think it was quadrupedal and that we should not have marked it as not being: well, it would have locomoted quadrupedally when on the ground, but it was certainly not optimised for quadrupedal locomotion in the sense that a sauropod, a cow or a cat is. Its bauplan was all about flight. I think I need more coffee this morning. Not sure what happened with the double negative there, but your explanation makes sense. 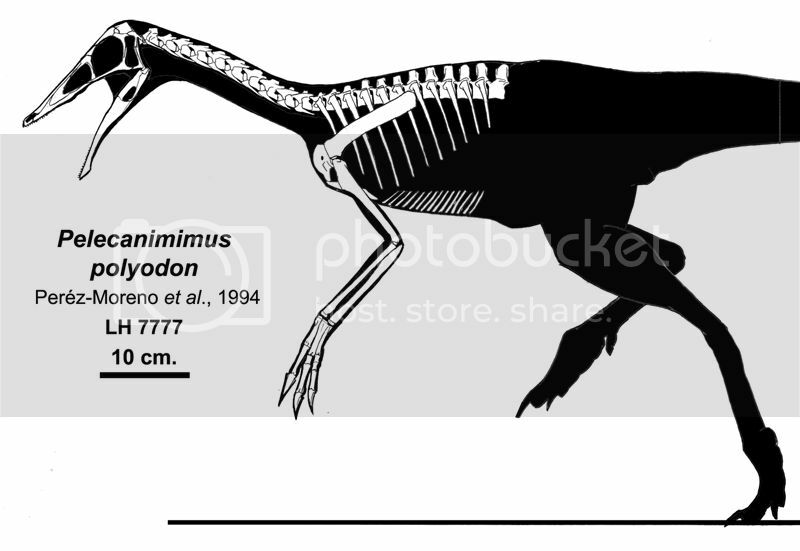 I am curious why your discussion on this taxon is limited, especially as you assume isometric scaling an an illustration of a much, MUCH smaller taxon (Struthiomimus altus, Lambe), and place it in general relationship due to one analysis (Kobayashi & Barsbold), when another (Senter’s 2007 analysis) finds it far more basal. Indeed, there has been some question about how closely related ornithomimids sensu stricto and Deinocheirus mirificus really are. There are further issues on what happens when you try to isometrically scale small-bodied taxa up, and that allometric scaling is the better model: for at least in therizinosauroids and tyrannosauroids, this results in far more robust cervical vertebrae, and shorter vertebrae on the whole. It is quite likely that shorter necks dominate earlier maniraptoriforms, a subject tested in Zanno and Makovicky in 2010 (neck elongation against phylogeny, as part of a component analysis on herbivory, which you do not cite, probably as it was published after your initial draft was completed?) and that the neck in Deinocheirus mirificus was significantly different from that depicted on various morphological grounds. For example, in Pelecanimimus polyodon, the neck is barely longer than the skull, just as it is in Caudipteryx zoui and in Shuvuuia deserti. While Osmólska and Roniewicz describe no neck material, part of the collected holotype they examined (with discovery of a bonebed that has been indicated to be the type locality) includes perhaps two additional but almost certainly damaged bones identified as possible cervicals, but there is a lot of interpretation to be had, which I had a go at a decade ago. As your MS notes, the same is also true of Gigantoraptor erlianensis, just as it is with Therizinosaurus cheloniformis. Comparisons with other therizinosauroids can easily imply that relative neck length decreases with size, rather than increases. These therizinosauroids have typically massively short torsos, and one might hypothesize that as the same is true in other large theropods like tyrannosauroids, it will be true in Gigantoraptor erlianensis and Deinocheirus mirificus. These question the use or even value of including these two taxa, on issues regarding cervical elongation relative to … well, anything. I like that you put this out: data is data. But that would have served just as well being posted to the blog for all intents and purposes. The same general discussion might have occurred. There is obviously the issue that you want to cite this in further research, but there is no reason submission to a journal and waiving one’s emotional bias and investment on their own work in order to even kowtow to the somehow unreasonable demands of reviewers. Moreover, the development of elongated necks may very well be related to herbivory in several respects, something that a later draft of this manuscript should consider. This may suggest that the details of neck elongation are not discussed in enough depth: not just for feeding envelopes, the ability to increase due to pneumatic diverticulae invaginating the bone, degree of “airyness” of vertebrae to length and to length of neck and to size, principle components analysis on the various factors discussed to test for correlation, or mapping against phylogeny to test for signal and thus also potentially decouple the length of the neck from function, or the evolution of various feeding styles to neck elongation. OK, I read it now. My original response stands: the paper is not about Deinocheirus. All we wanted to do was get a ballpark figure for how long theropod necks got, and we found that all three of the clades to considered seem to come out in the region of 2-2.5 m. Of course those numbers could easily be out by say 20% in either direction, but that doesn’t affect our point that sauropod necks were five times as long. Another giant theropod, Deinocheirus mirificus Osmólska and Roniewicz, 1969, is known only from a pair of forelimbs, of which the left humerus is 938 mm long (Osmólska and Roniewicz, 1969, p. 9). Deinocheirus probably belongs to the long-necked ornithomimid group of theropods (Kobayashi and Barsbold, 2006) and thus may have had roughly the same proportions as Struthiomimus Osborn, 1916. Osborn (1916, pp. 744–745) gives a humerus length of 310 mm for Struthiomimus, and a total neck length 2.5 times as long, at 770 mm. If it was similarly proportioned (Figure 2.3), Deinocheirus would have had a neck about 2.35 m long. Seems to me that we defined our areas of doubt and uncertainty pretty explicitly. Your paper involves Deinocheirus mirificus; my comment was not “about your paper” but about a subject IN your paper. It isn’t relevant? I should add that of all the taxa you discuss, and especially those shown in your figures (1, 3, and table 3), the theropods in question represent greater than 1/4th the representatives. This is interesting in that they are use to compare directly to giraffes and perissodactyles, in having more sauropod-like “correlates” to neck length than those mammals. It is further interesting in that in two of them, other taxa are used to substantiate the claims made about their vertebral completeness or pneumaticity, when in fact (for Deinocheirus mirificus and Therizinosaurus cheloniformis) the issue is unknown, which places these taxa in the “giraffe/perissodactyl” bracket. It was this, and this alone, that my comment intended to resolve. That, and the analytical processes that would benefit this manuscript prior to submission — how to tell whether your components are “valuable.” That was all. I’m afraid I’ll have to join Jaime on the theropod bandwagon. 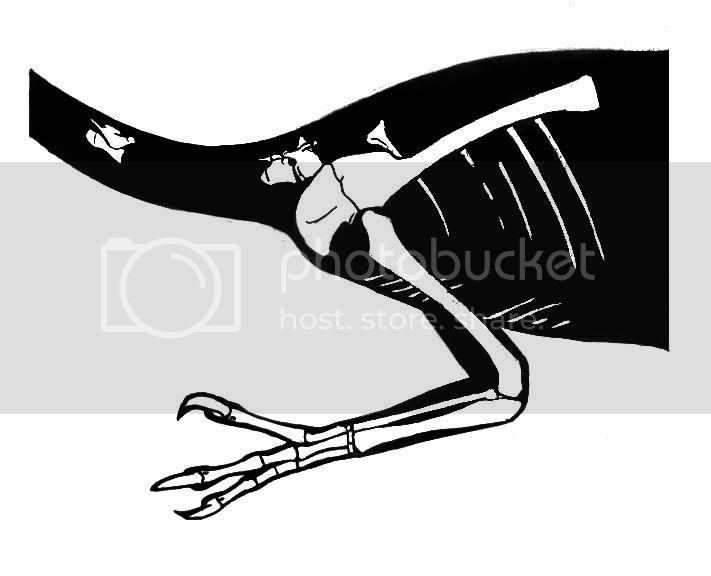 Therizinosaurids actually have quite elongate cervicals (e.g. Nanshiungosaurus? bohlini has an EI of 3.95 for cervical 3), and can have large numbers of them too (e.g. Neimongosaurus has 14, as you cite). Even Nanshiungosaurus has 12, despite Paul only giving it ten. In fact, you use the neck/humerus ratio of 2.9 from that reconstruction, but Nanshiungosaurus doesn’t preserve the humerus, so Paul was just guessing on proportions there. Neimongosaurus has a ratio of 3.62. Or if we estimate a 12 cervical neck for Nothronychus based on the preserved centrum lengths, we get a neck 4.26 times humeral length. Which leads to 3.2 meters instead of 2.2. Ditto for the Gigantoraptor author giving that taxon 10, when all oviraptorosaurs have 11-13. I also agree with Jaime that as a basal ornithomimosaur, Deinocheirus probably had a somewhat large head. But as you say, none of this would affect the fact these taxa have much shorter necks than the pictured sauropods. I think the reason the illustrated sauropods have such long necks in comparison to other long-necked animals is merely because they’re bigger. If you would scale neck length to some ‘neutral’ measure like torso or femoral length, the factor of five level of disparity would disappear, especially taking average sauropods into account instead of exceptions like Mamenchisaurus. Indeed, elasmosaurs and azhdarchids would probably beat sauropods soundly. Kudos on using arxiv though, and I’m sad to hear the Omeisaurus type is lost. Okay, two things here. First, now you’re talking about relative neck length, or neck length proportional to body size. Although the paper certainly touches on that a bit, the big story–at least the big story Mike and I are most interested in–has to do with absolute neck length. Some people have criticized us for this, as if absolute neck length is not something worthy of comment. But we’re interested in the biological problems that come along with a long neck, like support, movement, getting air and blood from one end to the other, and so on, and all of those problems are exacerbated at large size. Also, we do think it’s interesting that the longest-necked sauropods had necks twice as long as the longest-necked elasmosaurs and five times as long as the next longest-necked terrestrial animals. It’s not like they had femora or ribs or dorsal columns or even tails five times as long. And it strikes us as suspicious that essentially all the other terrestrial contenders crap out around the 3-meter mark. It’s almost as if there is some factor or set of factors that limits neck length for most animals, that sauropods were able to not just overcome but shatter. Second, about the theropods. Thank you, sincerely, for the clarifications on cervical count and so on. We might include that in whatever version of this gets sent to PeerJ in a couple of months. But we might not, too, because it doesn’t change the big points at all. And those big points are, one, for all of these longest-necked theropods we are estimating total neck length based on very incomplete material, or no published cervical material at all, in which case any uncertainty about cervical count is swamped by the massive uncertainty in reconstructing the necks anyway. And two, adding a cervical or three is not going to change the overall picture. If one of the big therizinosaurs or ornithomimosaurs had a 3.2-meter or even a 3.5-meter neck, that’s still less than a fourth of the length of the neck of Supersaurus. So whether the longest-necked sauropods had necks a full five times longer than the next (terrestrial) runners-up or only four-point-something times longer, it’s still a striking disparity, and one worthy of investigation. I guess. I’m just not very interested in it. No offence to theropods, but they are not the focus of the paper. If you can come up with a better estimate for the neck lengths of the biggest ornithomimosaurs, therizinosaurs and oviraptorosaurs, I’ll be happy to incorporate them into the next draft of the paper, if there is one. No, that is an explicit reference. We spell out precisely what we are doing with the theropods, and point out exactly how our speculative numbers could be wrong. I really don’t see what you think we should have done differently. A nitpick: On page nine you write that the largest known cervicals in titanosaurs are from Puertasaurus. However the north american remains that have recently been referred to Alamosaurus include a cervical that is similar in size if not larger, see Figure 1 in Fowler and Sullivan. .
Fowler, D.W. and Sullivan, R.M. 2011. The first giant titanosaurian sauropod from the Upper Cretaceous of North America. Acta Palaeontologica Polonica 56 (4): 685–690. While I certainly think it’s interesting to know how large animals with long necks work, I must admit to finding the question of why megasauropods have the absolute longest necks of any animal somewhat pointless. It’s like asking why baleen whales have the longest heads of any animal. You could say because they’re plantonivores, or because they have short necks, or because the water supports the weight, but the simple answer is because they’re the biggest animals. Megasauropods are simply the biggest animals with long necks, and much like azhdarchids and elasmosaurs, diplodocids and mamenchisaurids truly do have very long necks for their size. I must admit to finding the question of why megasauropods have the absolute longest necks of any animal somewhat pointless. Okay, one more try. I get interested whenever I see a gap in nature. Take mass extinctions. For all that we hear about the “Big 5” mass extinctions, there is actually nothing special about them relative to the others. If you line up all of the mass extinctions in rank order by the number of taxa killed off, they just tail off forever. The gap between #5 and #6 is trivial. It’s smaller than the gap between #1 and #2. So the idea of the “Big 5” mass extinctions is a human construct. We took the continuum of extinctions and drew an arbitrary line across after the fifth-biggest. We could have drawn the line anywhere; it would make just as much sense to talk about the “Big 3” or the “Big 10”. (I first saw this demonstrated by Norm MacLeod in a PalAss Newsletter in the early 2000s; sorry I don’t have the exact issue number to hand). I don’t know this for certain because I haven’t run the numbers, but I suspect that the same is true for lots of biggest body parts in organisms. The biggest sauropod femora are not twice as long as the biggest theropod and ornithopod femora. The biggest whale skulls are probably twice as long as the biggest pliosaur or ichthyosaur skulls but they are not 5 times as long. And so on for almost any body part or body region one could mention. But then we get to necks and the longest sauropod necks are more than twice as long as the next-longest necks of anything, period (in this case, elasmosaurs), and 5 times as long as the next-longest necks of anything on land. That’s a big gap. It’s not just an arbitrary human construct, like the line between the “Big 5” mass extinctions and the rest. And we think it’s worthy of investigation. If you don’t, that’s cool. We don’t expect everyone to swoon every time we publish a paper. But just saying “your work is uninteresting” is not something we can take action on; it basically amounts to saying “you should have spent your time doing something else”, and that ship has sailed. And although we always welcome comments on our work, after telling us twice, at length, that our paper is uninteresting, I think you can consider your point made. If I may add to Jaime’s remarks here: the neck material reported from Deinocheirus (“also”, should the vertebrae indeed include cervicals) consisted of two ceratobranchialia. These indicated an upper neck width of about two feet, perhaps a sign the neck indeed was not elongated. By the way, the article is eminently readable and makes for a very interesting story! Awesome paper, I love finding little tidbits about Amphicoelias! but the other, which we’d waited five months for, dismissed our 53-page manuscript in 108 words. So two words per page, or about 2/3 of a word per day of review time. But let’s not dwell on that. Wow. The editor should have rejected that review and solicited another from someone else (adding to the delay, but still). You are using a deliberative discussion of the nature and relationship of a large “ornithomimosaur” on one hand, then claim that scaling up any ornithomimid is useful. Instead of using said ornithomimid, and discussing the potential allometric or isometric size variation in which you can make explicit your size projection on that taxon. That is, instead of using the CLADE, you used a specific taxon, and implied the material present in said taxon was complete enough to demonstrate your argument. This is no more clear than your use of “genera” in place of these CLADES in Table 3. This is to some degree OBFUSCATORY. It is why as systematists people should be using the SMALLEST clades useful. It is further problematic that you chose a derived ornithomimid when the phylogenetic position of Deinocheirus mirificus is NOT certain: Senter, in his JSP paper, recovers it in a far more basal position, where neck length may have been SHORTER. Senter, P. 2007. A new look at the phylogeny of Coelurosauria (Dinosauria: Theropoda). Journal of Systematic Palaeontology 5(4):429-463. The same is true for the caenagnathoid Gigantoraptor erlianensis, or the therizinosaurid Therizinosaurus cheloniformis; in the latter, at least, simply using a smaller taxon and “sized up” would have been just as useful. 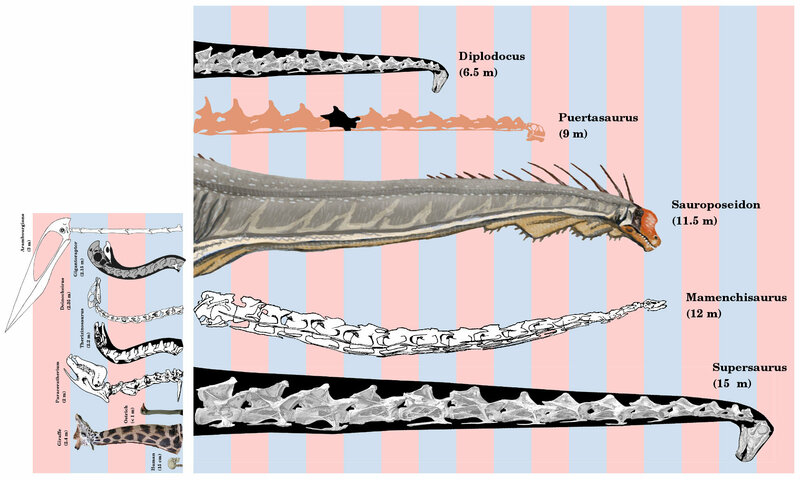 This is particularly interesting when, if the images used without the explicit captions are spread about the internet would seem to tell readers — many of whom are lay and wouldn’t read the paper itself — to think that these images represent Deinocheirus mirificus or Therizinosaurus cheloniformis themselves … which they do not. Paul’s illustration of the latter, at least, was created as a “composite” of a giant therizinosauroid, composed of the parts of several component taxa. Gigantoraptor erlianensis is a special case, as the original paper placed it as a basal oviraptorid (relatively short cervical vertebrae in comparison to caenagnathids), but later references (such as Longrich et al., 2010’s paper on Machairasaurus leptonychus) imply caenagnathid affinities, which have longer, lower cervical vertebrae, and they may have fewer numbers (based on the Triebold specimens CM 78000/CM 78001 and Avimimus portentosus). So there’s a bit of evidence that shows that it would have had longer, lower cervical verts, but may have had fewer of them; while Khaan mckennai has shorter, smaller, and far more numberous verts. Longrich, N. R., Currie, P. J. & Dong Z.-m. 2010. A new oviraptorid (Dinosauria: Theropoda) from the Upper Cretaceous of Bayan Mandahu, Inner Mongolia. Palaeontology 53(5):945–960. It is impossible, given the variability of the neck in oviraptorosaurs, to settle on just one morphology based on the options given. It is fine to pick one, but you must note the others, and consider their effects. The same may be true of therizinosauroids, where larger forms developed more robust, “deeper” necks, but length may have varied, becoming longest in Neimongosaurus yangi. Part of my critique involved a lack of analysis of the components discussed in the paper, to test for relevance to the ms’s thesis, that these features are at all related to overall neck length, and that “giraffes have short necks.” When there is some essential variation in merely counts, vert proportions, and relative neck lengths, without tabulation of the variables to species, it seems that the argument is merely used to find data the serves to support qualifying sauropods as long-necks animals, but mammals as short; or rather, that mammals cannot attain longer necks without pneumatic structures or longer torsos. As I mentioned, the best course would have been to be FAR more explicit in your characterization and relationships of the factors involved, by performing a small host of analyses. However, most of my arguments stem from what I view as poor referent choices, when to discuss broader clades, one can do so with broader discussion. This means one can look at explicit measurements in more detail, and take longer describing the relationships of “long-necked” clades, instead of choicing out one-paragraph statements, leaving much to be desired. 1) By “long neck” you mean absolute rather than relative size (at least gathering from the discussions here). I would recommend clarifying this outright at the start of the paper. I think much of the confusion and frustration in discussions at SV-POW! has centered around this issue. Yes, I know it should be apparent in the paper, but we readers are generally pretty dumb. 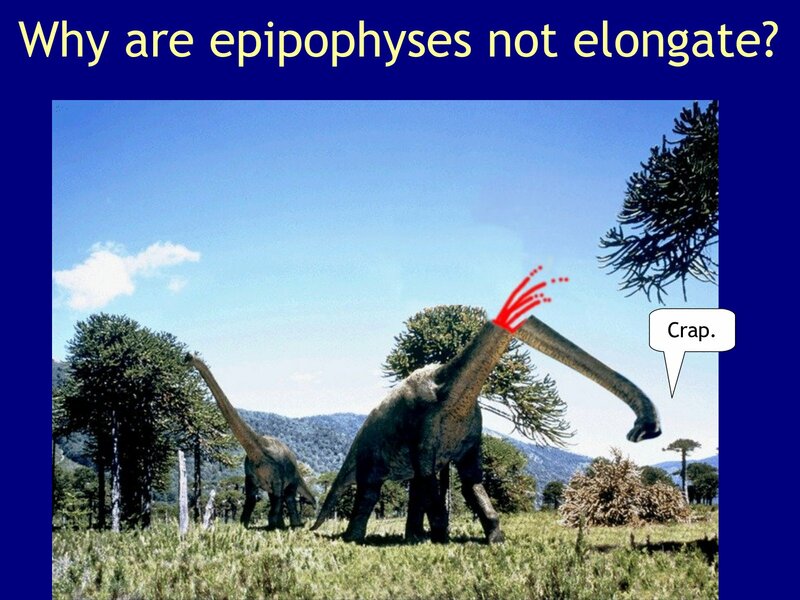 2) In your survey of long-necked critters, you might add Tanystropheus and kin. The largest ones topped out at 6 meters long, half of that neck. These are aquatic too, but represent another evolution of the long neck. 3) Re: plesiosaurs, the support of water wasn’t the only issue – they also had to contend with drag and other oddities at a much greater level than would most terrestrial animals. So, being a long-necked aquatic animal isn’t all kittens and flowers! Thanks, Andy, some really useful thoughts there. I’ll reply properly later, just wanted to acknowledge for now. Thanks for publishing this to a post, its very refreshing to read versus the superficial Discovery type “goofy” treatment of similar topics. Topics that involve gigantism (whether insect or sauropod) and in particular Pterosaurs seems to still be a field without consensus and from my Engineer amateur point of view – harbors some pretty weak theories. On the positive side there is still much to figure out! Specifically the neck length seems to reflect a great degree of success that might be analogous to the (non natural selection) of the sameness of every jetliner shape you see today. With A successful design that lasted million of years one EXPECTS to apply the scientific method and find a clear explanation. The neck length debate is very interesting in that way. The same for Quetzalcoatlus – somehow this animal did in fact exist and evolved successfully – no matter how clever the explanation the strangeness is stunning.